The Mask of Zorro online slot game played at Fly Casino is a 5-reel, 40-payline game that is based on the 1998 blockbuster film. All of your favorite characters are featured! Antonio Banderas as the masked ‘Zorro’, along with a large cast. Symbols on the reels are Zorro (Antonio Banderas), Elena Montero (Catherine Zeta-Jones), Don Viego de la Vega (Anthony Hopkins), Captain Harrison Love (Matt Letscher), Don Rafael Montero (Stuart Wilson) and the wild symbol (Zorro). The wild is the most sought after as of course it is wild, but getting five of with a max bet pays 1000X. We LOVE this feature! 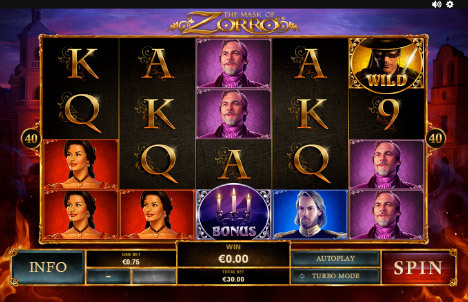 The Mark of Zorro feature is triggered during the main game and free spins randomly. But, do not despair, it comes up rather often keeping you at the edge of suspense after every spin. If triggered, a very cool looking ‘Z’ slices through the reels in a Z-like pattern adding 4 to 10 wilds to the reels and most often turning into winning results for you. The Secret Cave free spins bonus is played when the bonus symbol appears on reels 1, 3 and 5. A new screen opens up which displays 6 candles for you to pick 2 candles to reveal the free spins and multiplier. Initially 5 free spins are awarded with a multiplier of 1X. As you select you will add more spins or multipliers to your feature spins. Simple enough and well rewarding. YOU MUST TRY THIS NEW GAME! 133% Up to $133.00! From 00:00GMT until 23:59 GMT, all members on their deposit of $/£/€30 or more will receive a 120% bonus up to $/£/€133.00.